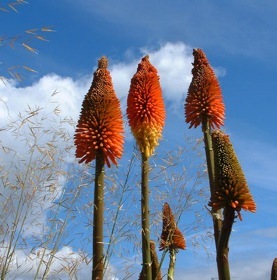 This is a vigorous, clump-forming, evergreen perennial with narrow grey/green leaves and tall orange-red luminescent flower spikes, fading to yellow towards the base. Kniphofia uvaria ‘Nobilis’ can bring architectural character to borders and beds and is a good companion plant for daylilies. This is a hardy perennial, able to cope with deer browsing, drought, heat & humidity, pollution, rabbits, seashore and slopes but does require free draining soil. In it’s native South Africa this genus is pollinated largely by sunbirds.